In today’s blog, I’ll cover the lastest family of microbiology methods used for testing fuels & fuel associated water. These methods fall under the category genomics – the study of genes. Warning: genetic testing is more technically complex than the methods I’ve described in recent posts. I’ll do my best to keep the language as simple as possible. 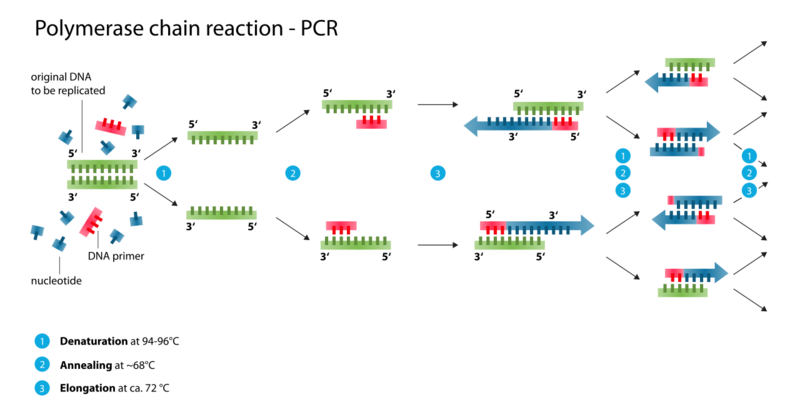 1) Genetic material (deoxyribonucleic acid – DNA) extraction (fig 1). 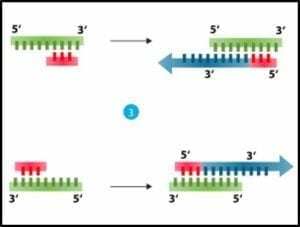 2) Heating to separation of the two strands of DNA’s double helix (fig 2) into two single-strands. 3) Cooling and using an enzyme – polymerase – to convert each single strand back into double stranded DNA (fig 3). 4) Repeating steps 2 and 3 until there are millions of copies of each of the DNA originally extracted in step 1. 5) Using analytical tools to: identify the different types of DNA that were extracted from the original sample in step 1. Fig 2. a) DNA molecule ; b) section of DNA being denatured to two single strands. Fig 3. Denatured DNA (left) coupled with primer and reacted with DNA polymerase to form two new double helices. 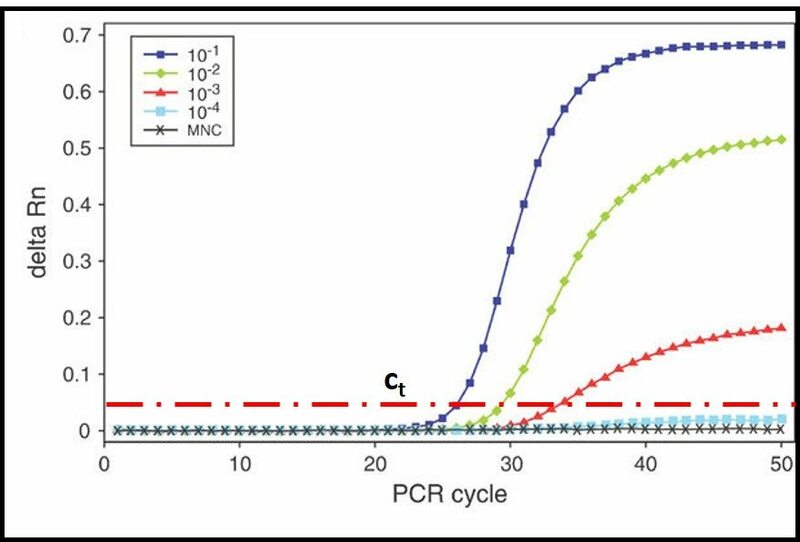 When PCR methods were first developed in the mid-1980s, DNA was extracted from colonies that had developed on nutrient agar plates (see Part 12 and fig 4). Early PCR testing revolutionized microbial taxonomy. Microbes that seemed to be closely related because of their appearance and nutrient preferences turned out to be quite distant genetic relatives. Conversely, some microbes that had historically been classified as being members of different groups, were discovered to be nearly identical genetically. However, PCR could only be used to identify microbes that formed colonies. Fig 4. Bacterial colonies on nutrient agar. In the 1990s quantitative-PCR (qPCR) methods were developed. In qPCR, messenger-RNA (mRNA) is extracted and used to synthesize complimentary-DNA (cDNA). The PCR process then continues as described in steps 2 through 5. The RNA used for qPCR is typically tagged with a fluorescent dye. A fluorometer is used to measure the DNA concentration as a function of time during repeated cycles of heating and annealing (steps 2 and 3). As shown in fig 5, the time required for the fluorescence to reach a threshold value, can be used to compute the amount of mRNA that was originally extracted from the sample. This, in turn provides an accurate estimate of the population density (i.e., cells/mL) in the sample. Fig 5. DNA amplification curves: delta Rn is the amount of fluorescence detected and ct is the threshold delta Rn used to compute the DNA concentration in the original sample. The five curves show that the number of PCR cycles needed to reach ct increases as the original DNA concentration decreases. Four molecules (nucleotides) make up the genetic code (adenosine – A, cytosine – C, guanine – G, and thiamine – T). Each three-nucleotide sequence is the code for a specific amino acid. Thus, long strings of three-letter messages specify the amino acid sequence of enzymes – the cell’s machinery for carrying out all of life’s processes. The total genome of each type of cell (operational taxonomic unit – OTU) is unique. Because each of the four nucleotides – A, C, G, and T – has a unique electrical charge, each OTU’s DNA has a unique net electrical charge. 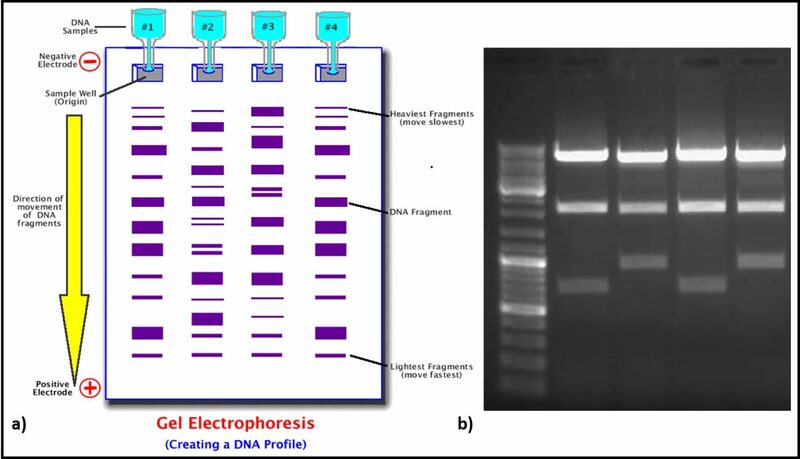 Using a technique called gel electrophoresis, after amplification (step 5) analysts can separate and isolate each type of DNA that was recovered from the original sample (fig 6). They can then sequence the genes and attempt to match the sample’s DNA against a DNA library. The result is a taxonomic profile of the microbes that were present in the original sample. Fig 6. 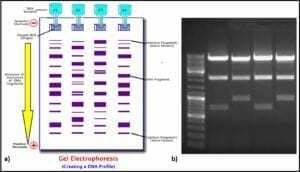 DNA profiling using gel electrophoresis: a) schematic illustration of process ; b) photograph of gel. In earlier posts, I’ve referred to Donald Rumsfeld’s “unknown unknowns.” Although qPCR and, the more recently variation called next generation sequencing – NGS, is a powerful tool for studying microbial communities in fuel systems, it is probably not the last word in microbiology testing. True, qPCR detects many types of microbes that are undetectable by historically used culture methods. However, extracting DNA or RNA from cells is as much art as science. 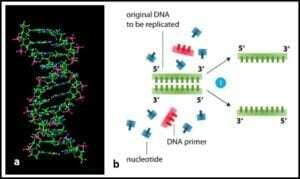 Genetic material that isn’t extracted isn’t detected. 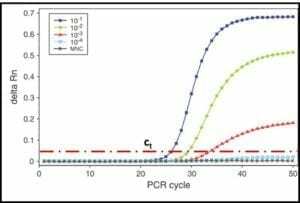 Additionally, qPCR testing depends on the use of primers – short sections of mRNA selected to either be universal (i.e., include a section of A, C, G, T basis that are believed to be present in all bacteria) or specific (i.e., include a section of genetic coding that is unique to a microbe of specific interest). Consequently, researchers are on a steep learning curve about how to select primers. As task force within ASTM D02.14 has just restarted work on a qPCR standard test method for fuels and fuel associated water. The last attempt stalled when participants could not agree on a consensus DNA extraction protocol. As the new task force makes progress I provide readers with updates. The goal is to develop a method that non-technical folks will be able to use. In the meantime, please contact me at fredp@biodeterioration-control.com you’d like to learn more about fuel system microbiology or microbiological contamination control. FUEL & FUEL SYSTEM MICROBIOLOGY PART 15 – TEST METHODS – HOW DO WE DETECT BUGS ON SURFACES? In my August post (https://biodeterioration-control.com/microbial-damage-fuel-systems-hard-detect-part-14-test-methods-still-microbiological-tests/), I discussed using ASTM D7687 to quantify microbial loads (AKA bioburdens) in liquid samples – fuels and fuel associated water. This post will focus on surface samples. Generally speaking, microbes tend to be most abundant on surfaces. By some estimates, in any given system, for every microbe floating in the bulk fluid, there are 1,000 to 1,000,000 growing on surfaces. These surface microbes are invariably part of biofilm communities. I’ll discuss biofilms in more detail in a future post. For now, it is sufficient to understand that biofilms are slime-encased microbial communities growing on surfaces (fig 1). It is much easier to grab a fluid sample than a surface sample. Consequently, most fuel system samples – even those intended for microbiology testing – are fluids. However, there are a few fuel system surfaces that can be sampled relatively easily. Fig 2. Automatic tank gauge, water float showing slime accumulation (right) and swabbed area (left). Biofilms tend to develop on automatic tank gauge (ATG) water floats (fig 2). The left side of the water float shown in figure 2 has been swabbed. The right side shows the undisturbed deposit. This deposit includes microbes, their slime, and metal fins (i.e. rust). Most often, I use a swab to collect a sample from a premeasured surface area. If the deposit is > 2 mm (1/8 in) thick, I use a spatula to collect the sample. The second location I routinely check for microbial contamination is the filter. Figure 3a shows a 76 cm (30 in) filter cartridge. It was one of 16 cartridges in a high-capacity filter housing. 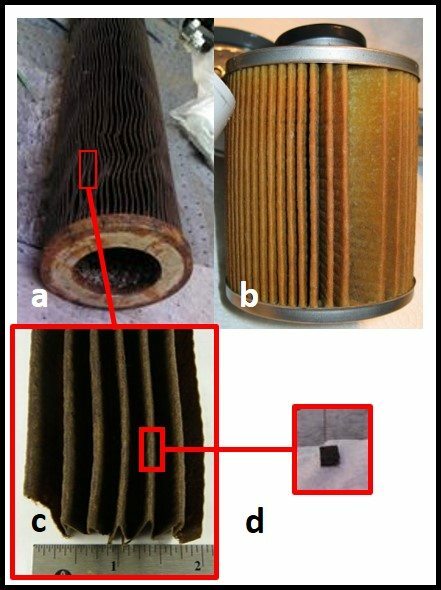 However, except for its length, the 76 cm cartridge does not look very different from the filter element inside a typical fuel dispenser filter (fig 3b). To test the filter element for microbial contamination, I first inspect the element visually; looking for slime accumulations or discolored zones. For larger filters, I use an alcohol-disinfected forceps and scissors to cut out a section ( 4 cm x 4 cm; fig 3c), and from that cut out a 1 cm x 2 cm piece of filter medium (fig 3d). For dispenser filters, I cut out a 1 cm x 2 cm piece directly. This is my specimen. If a dispenser has a screen (fig 4), upstream of the filter I collect either a swab or spatula sample just as I would from the ATG water float. Fig 3. 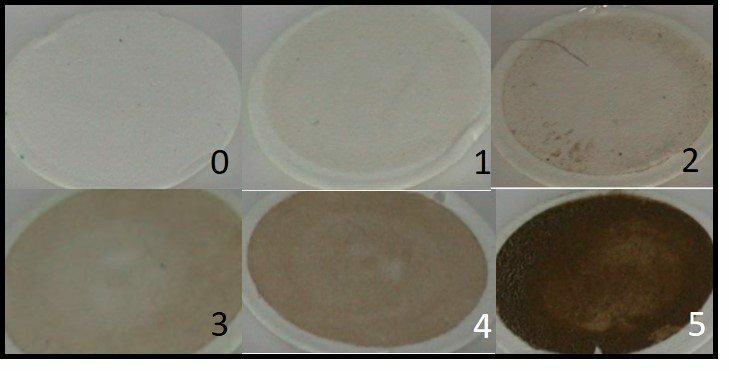 Fuel filter sampling: a) 60 cm filter element from high-capacity housing; b) dispenser filter element; c) section of filter media taken from element shown in fig 3a; d) 1 cm x 2 cm specimen taken from section shown in fig 3c. Fig 4. Fuel dispenser prefilter screen partially covered with slime. Once I’ve collected my surface sample I run LuminUltra Technologies, Ltd, Deposit and Surface Analysis (DSA) test (for more information about the DSA method visit https://www.luminultra.com/dsa/; for a video demonstration, visit https://www.youtube.com/watch?v=VEhpbvtej3E). The method provides me with a rapid, quantitative measure of the bioburden on these fuel system surfaces. Total ATP concentration ([tATP]) <100 pg/cm2 indicates negligible surface contamination. [tATP] between 100 pg/cm2 and 1,000 pg/cm2 indicates moderate contamination (it’s time for maintenance action). [tATP] ≥ 1,000 pg/cm2 signals that prompt corrective action is needed! If you have weighed out samples, the [tATP] per g threshold levels are the same as those for [tATP] per cm2. If you’d like to learn more about fuel system surface microbiology, please contact me at fredp@biodeterioration-control.com. The perhaps ungratifying answer is: “It depends on your intention.” Let’s start with an illustration. Fig 1 illustrates three ways to take a measurement. You can use a ruler or tape measure to determine an object’s dimensions. If It is a liquid, you can use a measuring cup or graduated cylinder to determine its volume. You can also use a scale to determine its weight. Each of these is a valid measurement, but each provides different information. Fig 1. Three different ways to measure. It’s the same thing with testing from microbial contamination. Each method that I illustrated in Blog Post 12, figure 1, provides useful information about the microbial population, but each provides different information. If you need to have pure cultures of microbes, on which to do research, culture testing is the most appropriate tool. If, however, you want to quickly determine how heavily contaminated your system is, then one of the chemical microbiology test methods is a better choice. A chemical microbiology test method is a method that detects specific molecules that are either part of or are produced by microbes. The three chemical microbiology methods illustrated in Fuel Microbiology Part 12 are: catalase activity, adenosine triphosphate concentration, microbial antigen detection. Today, I’ll write about the catalase test. In the interest of full disclosure, in the early 1980’s, after a University of Houston graduate student developed the HMB catalase test method (www.biotechintl.com), I did most of the method validation for a variety of industrial applications. I also developed ancillary HMB tests to verify that the test results were due to microbes. Starting in 1982, and for the next 27 years, the HMB was my primary field test for detecting and quantifying microbial contamination in industrial fluid systems. The catalase test is based on the reaction between the enzyme catalase and hydrogen peroxide. Catalase is the enzyme that made life in an oxygen-rich atmosphere possible. Cells that grow in normal air (aerobes) produce hydrogen peroxide as part of their energy metabolism. Catalase converts that hydrogen peroxide into water and oxygen. What makes the HMB test quantitative are its two primary components: a patented, electronic pressure gauge (figure 2a) and a stoppered reaction tube (figure 2b). The HMB pressure gauge is unique because there’s very little volume between its probe and its sensor. The stoppered reaction tube provides a fixed volume, so that headspace pressure increases as the concentration of oxygen gas increases within that space (the head space is the space between the top of the liquid and bottom of the stopper). To run the test, add a standard sample volume (typically either 3 mL or 10 mL) to a reaction tube, and then add concentrated hydrogen peroxide (one drop – = 0.05 mL – per mL of sample). Quickly replace the tube’s stopper (it is a septum cap that re-seals itself after it has been pierced with a needle) and briefly vent the tube. This ensures that the headspace pressure is 0 psig when the reaction starts. If there are aerobic microbes in the sample, they will race to convert the hydrogen peroxide to water and oxygen gas, before the hydrogen peroxide kills them. In the meantime, as oxygen is produced, it accumulates in the reaction tube’s head space. The universal gas law teaches that if temperature and volume are constant, the pressure in an enclosed space is proportional to the concentration of gas in that space. Simply put: the more catalase enzyme in the sample, the more oxygen in the headspace; the more oxygen the greater the pressure increase (fig 3). The reaction runs its course in <15 min. At 15 min, stick the reaction tube with the needle that’s attached to the pressure gauge (fig 1a) and read the psig. The psig reading at 15 min is proportional to the microbial contamination load. Correlation between culture test data and HMB catalase test data is generally very strong. Fig 3. Catalase reaction with hydrogen peroxide in reaction tube. a) negligible contamination = negligible oxygen accumulation = negligible pressure increase in headspace; b) heavy contamination = substantial oxygen accumulation = large pressure increase in headspace. However, the HMB test has its limitations. First: it only detects organisms that have the catalase enzyme. 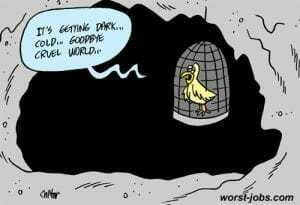 This excludes all anaerobes (microbes that only grow in oxygen-free environments) and aerobes that don’t have a complete catalase enzyme. Second: dissolved iron reacts with hydrogen peroxide to release oxygen gas. Samples with dissolved oxygen will appear to have microbial contamination. Third: at ∼25 psig the pressure is sufficient to launch the reaction tube’s stopper. The noise can be disconcerting and flying stoppers can be eye hazards. Moreover, the foam pouring over the reaction tube’s wall creates a mess. When microbiological contamination is negligible, it generates <1.5 psig pressure. 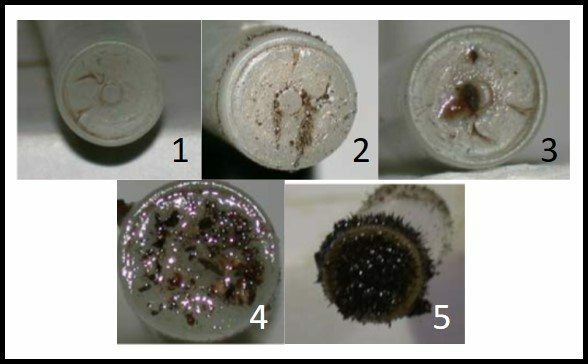 Heavily contaminated samples (many bottoms-water samples) will foam over before the reaction tube’s stopper can be put in place (have you ever seen the reaction when sulfuric acid is poured over a sugar cube; fig 4?). When this occurs, the sample must be diluted to get a quantitative test result. On the few occasions when curiosity has compelled me to get a quantitative answer, after observing a violent reaction in the original sample, I’ve found that the actual psig was 20,000 to 30,000 psig (yes, I had to dilute samples 10,000 to 50,000-fold in order to get a psig reading). Normally, either being unable to get the stopper onto the tube, or having the stopper launch before the end of the 15 min test period, provide the information I need to determine that the sample is heavily contaminated. Fig 4. 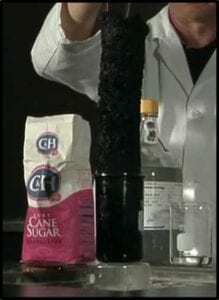 Column of sugar charcoal formed after adding sulfuric acid to sugar. The reaction is violent and exothermic (give off lots of heat). Earlier, I mentioned that I had developed ancillary tests for the HMB catalase test. One is used to determine if dissolved iron is producing a false positive result. The other is used to inactivate any enzymes in the sample. When testing unknown samples (i.e. : I don’t know whether they sample is likely to have dissolved iron), I run four tests: hydrogen peroxide (H2O2) only, H2O2 + a chelating reagent (prevents the dissolve iron reaction), H2O2 + a poison (inhibits catalase activity), and H2O2 + chelating reagent + poison (serves as a background control). The H2O2 result tells me if there is a contamination issue. If the chelating reagent reduces the psig by >90 %, then the psig observed in the H2O2 only test is due to dissolve iron. Similarly, if the chelator has no effect but the poison reduces the psig by >90 %, then the psig observed in the H2O2 only test is due to microbes. If both the chelator and poison are needed to reduce the psig by >90 %, then the sample has substantial concentrations of dissolved iron and microbial contamination. In the meantime, if you’d like to learn more about fuel and fuel system microbiology testing, please contact me at fredp@biodeterioration-control.com. Since November, this series has progressed through fuel system sampling, sample handling and non-microbiological tests used to detect biodeterioration. This post, and the three to follow, will cover microbiological testing. Fig 1. Ability of different microbiological test method to detect all microbes present in a microbiome. The largest circle represents the total microbiome – all the microbes present in a particular environment. The parameters portrayed in the figure are not exhaustive. For example, the figure does not include direct counts: the use of a microscope to examination samples and count the number of microbial cells per microscope field (the area visible when looking through a microscope’s lenses). Nor does it include tests that measure the concentration of building block molecules such as proteins, carbohydrates, or fatty acid methyl esters (FAME). Direct counting is labor intensive. Moreover, it can be difficult to distinguish between microbes and microbe-size inanimate particles. Finally, there is considerable debate about whether direct counting includes both live and dead cells. Although, theoretically, direct count methods detect 100% of the total microbiome, direct counting is rarely used in practice. Culture testing is currently the most commonly used tool for determining bioburdens in fuel and fuel associated water samples. Culture testing depends on microbes captured in a sample to be able to reproduce (proliferate) either in or on the growth media used to perform the test. The growth media can be either solid (ASTM Practice D7469), semisolid (ASTM D7978), or liquid (for example: LiquiCult Test Kits – LiquiCult is a trademark of MCE, Inc.; http://www.metalchem.com/liqui-cult.html). First developed in the late 19th century to detect disease causing microbes, culture testing is now often used without any real understanding of its real purpose or its limitations. To produce a visible colony (mass of cells), a microbe must reproduce. A generation is the time required for a population to double: for one cell to become two; two to become four, etc. A visible colony has at least 1 billion cells. 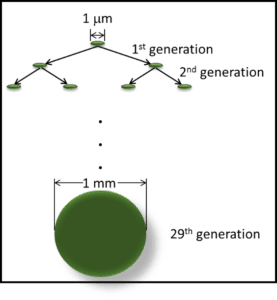 It takes 29 generations to get from one cell to a billion cells (fig 2). Fig 2. 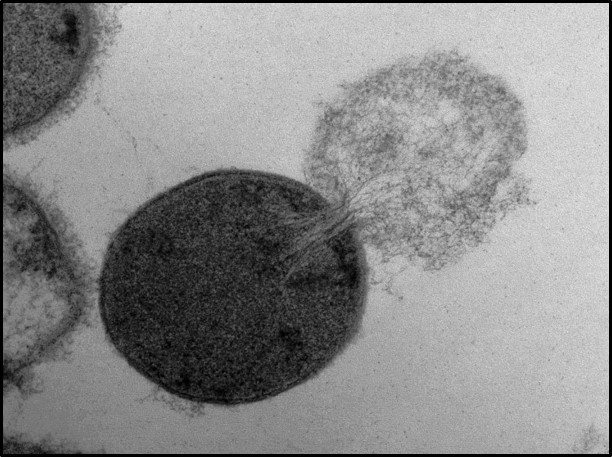 Microbe proliferation from individual cell to visible colony. To reproduce, a microbe must have the right nutrients and environmental conditions. There are more than 5,000 different recipes for microbiological growth media. Each one is optimized for the nutrient requirements of specific types of microbes. No individual type of microbe will grow on all media. Additionally, different microbes have unique preferences for growth conditions (atmosphere with oxygen present versus oxygen-free atmosphere; acidic, neutral, or alkaline environment; cold, temperate, or hot – >40 °C/104 °F; etc.). Consequently, the 1% recovery estimated in fig 1 doesn’t reflect the detection power of all test method combined. It reflects the sensitivity (actually: insensitivity) of any individual culture method. If an analyst ran thousands (perhaps millions) of different combinations of growth media and conditions, the combined results might detect 50% to 60% of the total microbiome population. There are still many microbes that we do not know how to culture. In addition to the selective effects of any combination of growth medium and incubation conditions, time affects culture test sensitivity. Known microbe generation times range from 15 min for the fastest growing bacteria to 30 days for the slowest. The fastest growing microbes can proliferate from single cells to visible colonies in less than a day. 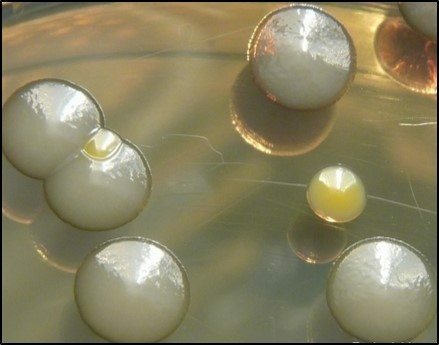 A microbe with a 4h generation time needs nearly five days to from a visible colony, and one with a 30-day generation time needs nearly 2.4 years! Most commercial test kits recommend observing colonies daily, for up to three days. Any microbe with a generation time longer than 2h is unlikely to be detected. Analysts testing samples contaminated with microbes that have generation times of >2h will incorrectly conclude that the samples are uncontaminated. Notwithstanding these limitations, culture testing has been used with reasonable success for more than a century. It remains the only tool available for obtaining pure cultures on which to do additional testing. Consequently, the take home message is not to dismiss culture testing. Rather it is to recognize that culture testing has specific uses. Obtaining an estimate of total levels of microbial contamination (i.e. : bioburdens) is not one of them. In the next several blog posts, we’ll look at tools better suited for that purpose. 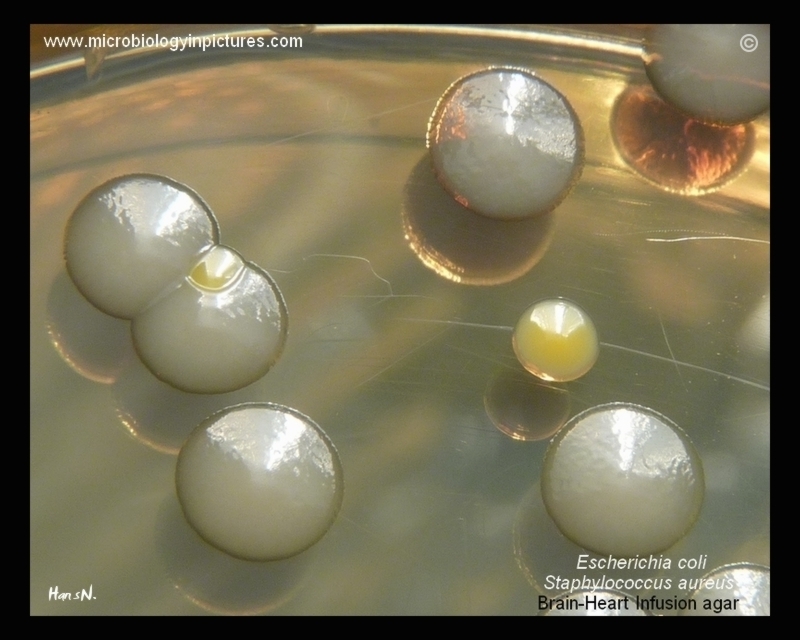 FUEL MICROBIOLOGY – WHAT IS THE RISK OF INFECTING A TANK? I recently received a question regarding the use of one tank-stick to measure multiple tanks. The question was: “if you stick a tank that is contaminated into the next tank, will it contaminate the second tank?” That is: can the microbial load carried over from UST to another, on a gauging stick, infect the second UST? Given how much press there has been lately about how easy it is to spread disease through brief, hand contact with contaminated surfaces, this is an excellent question. I thought that others who read this blog might be interested in the issue. No doubt your are extrapolating from your general understanding of how diseases can be easily transmitted either by the traces we transfer from first contacting a contaminated surface and then eating a sandwich – thereby ingesting the microbes we just transferred from our hands to the sandwich. Or, perhaps a better example is how easily viral diseases are transferred by mosquitos. A fraction of a mL of mosquito saliva can transfer a sufficient number of viruses from an infected host to a new victim. • If a technician is using water paste, they are likely to wipe down the stick between tanks. • Fuel is volatile; evaporation after the stick is pulled from a tank is likely to desiccate (dry out) any microbes that adhered to the stick while it was in the tank. If they are not already in a dormant state, the microbes adhering to the stick won’t have had sufficient time to transform from the active (vegetative) to dormant state before the product evaporates. Even though diesel evaporates more slowly than gasoline, it acts as a desiccant (that’s why vegetative microbes are not found in fuel that doesn’t have dispersed water present). • Fuel systems are more hostile environments than human bodies. In microbiology we have a concept of minimum infectious dose. Typically that minimum is in the thousands or millions of cells. If the number of cells transferred is below the minimum infectious dose, then the population will most likely die off rather than seed the development of a new population in an uninfected tank that is gauged after an infected tank has been gauged. • Water: 100 ppm water in 10,000 gal fuel = 1 gal water. If only 10% of that dissolve/dispersed water settles out, that’s 0.1 gal/delivery. A tank receiving only 1 delivery/wk will accumulate >5 gal/year in free-water. My 10% dropout rate is based on daily deliveries, so it’s more likely (and common) to see closer to 300 gal/y. • Air: this might be changing as newer vapor recovery and vent systems replace current systems, but the volume of air entering a tank equals the volume of fuel withdrawn. These systems do not scrub water, pollen or dust from the air. A USAF global fuel system survey completed about 10 years ago determined that the profile of microbes found in fuel tanks closely mimicked that found in the nearby air (the research team took air samples and tank bottom samples). The research team reported much closer relationships between what they found in the air near fuel tanks and what they found I fuel tanks, than between the fuel grade and microbial community profile. These results – of course – strongly supported the hypothesis that tank vents are a (if not the) major source of microbial contamination in fuel tanks. The next time I’m in the field performing a microbial audit of fleet or retail sites, I’ll test sounding sticks before and after using them to measure bottoms-water and product. If I find that sounding sticks are indeed picking up significant microbial loads, I’ll report that at a D02.14 Fuel Microbiology meeting, and might even write a paper on the issue. We are progressing from test methods that do not require any equipment (other the tools you need for sample collection) to those that require increasingly expensive tools. You can complete basic gross observations by relying on your eyes and nose. The physical tests I suggested in Part 10 require simple tools; including a magnetic stirring bar retriever, disposable syringes, filter pads and in-line filter holders. In this blog, I’ll discuss a couple of simple chemical tests. However, with one exception, the devices used to run these tests cost a few hundred dollars. This means that under most circumstances, I’ll be writing about tools that condition monitoring service teams, rather than individual site owners, should have on hand. Water paste is the exception I was referring to above. I hope that if you are reading this blog, you are familiar with water paste and how to use it to detect bottoms-water. For readers who are unfamiliar with it, water paste is a thick substance that can be applied to the bottom of a sounding stick or gauge bob (fig 1). Note that if the gauging stick does not contact the tank’s actual bottom, water that’s present might go undetected. Fig 1. Using water paste to detect bottoms-water. Left inset: gauging stick with bottom 6 inches coated with paste. The paste had been white, but had turned purple after having been lowered to the tank bottom and removed. The purple color change indicated that there were at least 6 inches of bottoms-water in the tank. Many UST have strike-plates under the fill-line. In this schematic, the UST has 0.25 inches of water. Because the strike-plate is 0.5 inches thick, gauging fails to detect the water. Had the stick contacted the UST bottom, just beyond the strike plate, the paste would have shown that 0.25 inches of water were present. Why do I list water-paste use as a chemical test? Because the color change is a chemical reaction. Also, if there isn’t any bottoms-water in your bottom sample, you cannot run either of the other two tests I’m covering in this post. Point of nostalgic disclosure: the chemical tests that I am about to describe used to be more useful than they are now. Many fuel additives can move from fuel into water. This process is called partitioning. 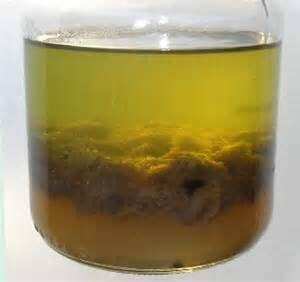 Let’s say that a particular additive is 100% soluble in fuel and 20% soluble in water. Whenever a fuel tank has any free-water, the additive will partition into the water until its concentration in the water is 20%. Keep in mind that in a UST with 7,000 gal of fuel and 70 gal of water (yes, that’s a lot of water!) the fuel to water ratio is 700 to 1. This means that even though the additive’s concentration is 20% in the bottoms-water, only an immeasurably small amount of the additive has partitioned out of the fuel. The fuel’s chemistry isn’t affected, but the water’s chemistry is. Let’s see how this affects pH and total dissolved solids (TDS). pH measurement provides an indication of an aqueous solution’s acidity. pH ranges from 0 to 14; with pH = 7 being neutral, pH <7 being acidic, and pH >7 being alkaline. The lower a solution’s pH, the more acidic it is. For example, the pH of stomach acid is in the 1.5 to 3.5 range (it’s essentially hydrochloric acid). Conversely, the higher the pH of a fluid, the more alkaline it i(bleach’s pH = 12). Historically, bottoms-water pH <6 was a good indicator of microbiological activity (microbes produce a variety of acids). Although pH <6 still suggests microbiological activity, some fuel additives act as buffers – they prevent pH change. Fig 2 illustrates the difference between adding acid to unbuffered water and adding it to buffered water. 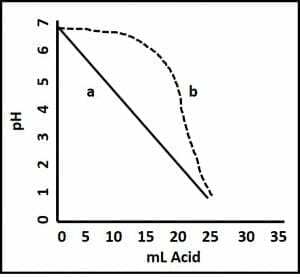 The pH eventually falls in both cases, but when buffer is present, it takes substantially more acid to get to the same pH. This means that in today’s fuel systems, pH drop is a later problem indicator than it was in the days before there were as many additives that partitioned into the water. Fig 2. Buffer effect. Acid is added to two aqueous fluids; both with pH = 6.8. Fluid a is unbuffered. There is a straight-line relationship between the volume of acid added to the sample and its pH. Fluid b is buffered. Its pH does not begin to change appreciably until after 12 mL of acid have been added. The easiest way to measure bottoms-water pH is to use pH paper (available from scientific supply distributors). 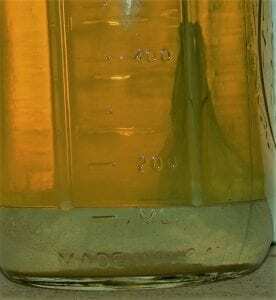 Transfer a few mL of bottoms-water into a clean test tube or other small container. 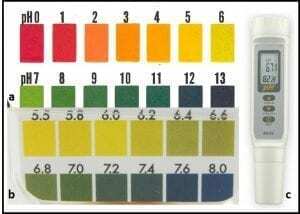 Dip a pH test strip into the water. After a few seconds, compare the color on the test strip against the color comparison chart provided with the test strips (fig 3). Generally, it’s sufficient to use tests trips that give whole pH unit results (fig 3a). If you want more precision, you can run a second test using pH paper that detects 0.2 pH differences (fig 3b). Digital pH meters (fig 3c) are generally more precise (reading to 0.01 pH units) than indicator strips. However, meters are more expensive than disposable test strips. 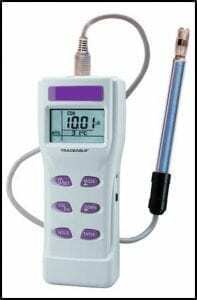 Additionally, if meters are not kept clean and calibrated, they can give you precise, but inaccurate results. 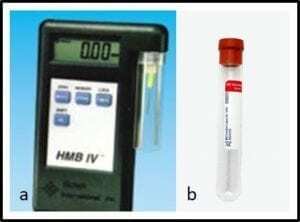 Fig 3. pH test kits: a) broad range (pH 0 to 13), pH test strips with 1 pH unit precision; b) narrow range pH test strips with 0.2 pH unit precision; c) hand-held pH meter. The final chemical test I’ll discuss today is TDS. As the name implies, TDS include all dissolved chemicals (organic and inorganic) in bottoms-water. Before the late 1990’s, typical gasoline bottoms-water TDS were in the 150 mg L-1 to 250 mg L-1 range and diesel fuel bottoms-water TDS were in the 250 mg L-1 to 500 mg L-1 range. High TDS concentrations would signal the presence of dissolved metals (corrosion byproducts), microbes and their metabolites, or both. However, the increased use of fuel additives that can partition into the water has translated into TDS >2g L-1 in both gasoline and diesel fuel bottoms-water. This high background TDS concentration can mask the contribution of microbes and corrosion to the total. There is a work-around, but the details are beyond the scope of this blog post. TDS can be measured by weighing the residue that’s left behind after the fluid has evaporated away. However, TDS is directly related to conductivity (the ability of a material to carry an electrical current). The easiest way to measure TDS is to use a handheld meter (fig 4). Most meters offer the option of showing either conductivity (µS cm-1) or TDS (mg L-1). If you collected a good sample, by the time you have collected water level, pH, and TDS data, you know quite a bit about the condition of the fluids in your tank. You are at the “if it walks like a duck and quacks like a duck…” point of your field testing effort. You should be 90% certain of whether you have uncontrolled microbiological contamination (MC) in your system. Final confirmation depends on microbiological test results. I’ll begin to discuss these in my next post. Of course, if you want to learn more now, please send me an email at fredp@biodeterioration-control.com. Let’s get physical. 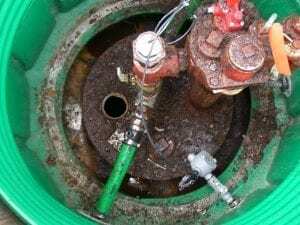 In Part 9, I discussed some very easy gross observation tests you can use to determine the likelihood of substantial microbiological contamination (MC) in fuel tanks (nearly everything in this blog series applies to tanks of all sizes from power tool tanks (<1 gal) to refinery bulk storage tanks ( as large as 500,000 bbl).This post introduces a couple of very simple physical tests you can run on bottom samples to detect fuel system damage that might be related to uncontrolled MC (biodeterioration). First, I’ll repeat something I’ve written previously: many individual biodeterioration symptoms are identical to the effects of non-biological processes. Do not draw conclusions from the results of any individual test. Treat each result as a piece of puzzle. At the same time, don’t forget: if it walks like a duck and quacks like a duck… What makes identifying MC and biodeterioration different, is that most of us can recognize a duck when we see one. Few of us have been taught how to recognize biodeterioration when we see it. The first physical test I’ll review in today’s blog is rust. If you have no particles visible in your bottom-sample, there’s no need to run the test. However, if you see particles, a sludge/sediment layer, or if the sample contains opaque bottoms-water, this is a quick test to determine whether the sample contains rust particles. The one tool you need for this test is a magnet. I use a stirring bar retriever – a 12 in long, Teflon (Teflon is a registered trademark of Chemours’ polytetrafluoroethylene – PTFE) rod, that has a magnet at one end. You can also use an uncoated magnetic retriever or screwdriver with a magnetized head (both available at most hardware stores). You simply dip the magnet into the sample, gently swirl it around the sample bottle’s bottom, pull the magnet out of the bottle, and look at it. Compare what you see with the five examples shown in Fig 1. 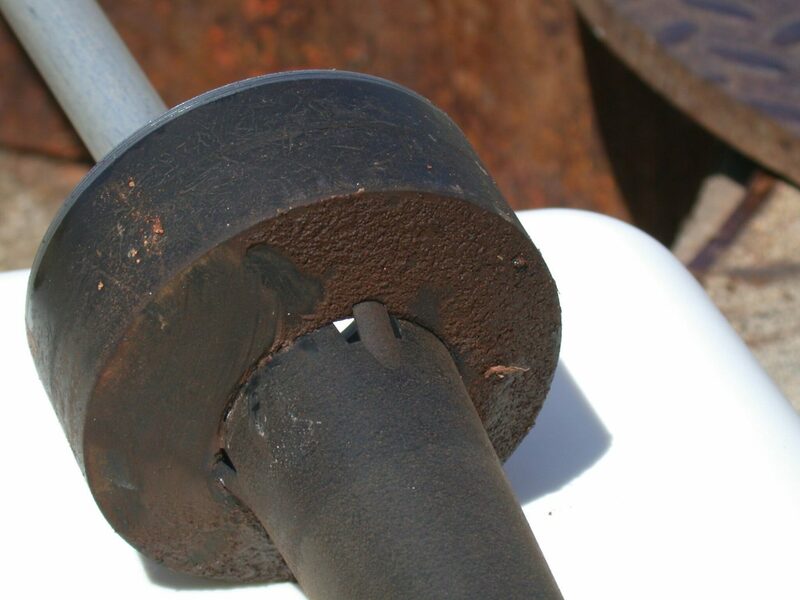 If the amount of rust is similar to that shown in photos 1 and 2, you probably do not have a corrosion problem. If you have lots of magnetic particles on the magnet (photos 4 and 5), then you most likely have a corrosion problem. 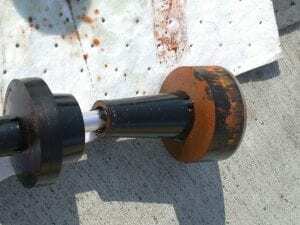 Photo 3 suggests that there some corrosion, but it is not yet serious. Note: These photos are from bottom samples I took from a fiber reinforced polymer (FRP) tanks. Don’t forget that even FRP tank fuel systems have metal components that can rust. Fig 1. Bottom sample, magnetic particulate load. 1 & 2: negligible contamination; 3: moderate contamination; 4 & 5: heavy contamination. The second test is just a bit more technical. To run this test, you’ll need a disposable, polypropylene, 50mL syringe; a 25 mm, in-line filter holder, 25 mm glass fiber filters, and a suitable waste receptacle for capturing the filtered fluid. Step 1: place a glass fiber filer into the filter holder. Step 2: remove the plunger from the syringe and attach the filter to the end of the syringe. Step 3: dispense either 25 mL of fuel or 25 mL of bottoms water. Step 4: Replace plunger into the barrel of the syringe and filter the fluid. 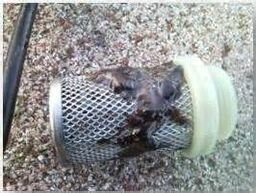 Step 5: remove filter from the filter holder and look at it; comparing its appearance with the illustrations in Fig 2. Just as with Fig 1, the higher the score, the more likely you have substantial MC in the system. 3 through 5 heavy contamination. Two quick and simple tests: One detects magnetic particulates and the other detects all particles that are trapped on the filter. A more formal version of the filtration tests includes weighing the filter before use, drying the filter and weighing it again after the residual fuel or water has evaporated off. After subtracting the filter’s original weight from its final weight and dividing by the volume filtered (sometimes you can push all 25 mL through the filter) you get particulate concentration in mg/mL. The lower the number, the better (ASTM D975 Specification for Diesel Fuel Oils; has a specification of ≤0.05 % by volume; this is ≤50 mg/mL). These two physical tests build on the information you get from gross observations. If both the gross observation and physical test results indicate MC, then it’s a good idea to have a couple of chemical tests run. I’ll discuss these in my next post. If you are impatient and would like to learn more now, please send me an email at fredp@biodeterioration-control.com.